2015 Honda Fit Pros and Cons: Why (Not) This Car? Since the Fit's debut as a 2007, car magazines have lavished much praise on the smallest Honda for its combination of agile handling, unexpected utility, and affordable price. They've been far less kind to the Nissan Versa Note. But I liked the Nissan, yet was underwhelmed by brief drives of the first- and second-generation Honda (review-fed high expectations didn't help). Honda redesigned the Fit again for 2015. My initial impressions of the third-generation car, from a brief drive last fall, informed Why Not to Buy a Ford Fiesta. But I really needed more time in the Fit, and have now completed a week in the driver seat. So, does the Honda Fit deserve to so often be the answer to My Next Car? requests? Or might the Nissan Versa Note (or some other B-segment hatch) be the better answer at least some of the time? The new Honda Fit's interior is more upscale. Which isn't the same as upscale. Why the 2015 Honda Fit? I'm going to go out on a limb (if only a few feet) and predict that the new Honda Fit will remain among the most reliable cars you can buy. Why the lack of certainty? Redesigns can create problems where there were none before. Also, the third-generation Fit is hencho en Mexico. Except for the transmission--that's shipped across the Pacific from Indonesia. I don't ascribe much importance to where a car is manufactured in itself. Engineering and quality control processes--for components at least as much as final assembly--matter much more than the location of the assembly plant. But the Mexican plant is new with a green labor force, so initial cars might have been glitchy. On the tested car, the doors weren't as precisely aligned as in the typical Honda. Now that they have a year under their belts they've likely gotten their act together. Through the end of 2014 the new Fit scored pretty well in our car reliability survey. As has the also made-in-Mexico Versa Note, but I have less confidence in the Nissan's score owing to much smaller sample sizes and a less laudable previous generation. In both cases it's far too early to predict long-term reliability, but the Honda has the better track record. The Honda Fit's rear seat folds to form a significantly lower floor than the Nissan Versa Note's, contributing to far superior cargo volume, 53 vs. 38 cubic feet. Honda accomplished this "magic" (their word for the seat) by locating the fuel tank beneath the first row rather than the second. Other small cars have achieved relatively low cargo floors by having the seat bottoms tip forward against the front seats. In addition to reducing the length of the cargo floor, this also makes for a more tedious process. The seat bottoms must be tipped forward before the seat backs can be folded, and this first step can't be performed through the hatch opening. In a sign that the old, innovative Honda never quite went away (it's now coming back), for all three generations of Fit it engineered a mechanism that shifts each seat bottom forward and downward as the corresponding seat back is folded, a one-step process. But wait, there's more. If you want to carry items too tall for the regular cargo area you can fold each seat bottom up against the seat back. I don't know how often owners use this feature, but it's quite nifty. Not beautiful, but interesting, with some nicely integrated details. Plus a thick band of chrome. The large HVAC knobs are easy to operate. The knobless infotainment interface is not. Hondas have been lagging the leaders in fuel economy. But with new "Earth Dreams" engines and CVT transmissions (pardon the redundancy), they've closed the gap. When fitted with the CVT (continuously variable transmission), the Fit LX rates 33 mpg city, 41 mpg highway in the EPA's tests. The city rating is especially impressive, and both figures are much better than the 2013 Fit's 28/35 (with a five-speed conventional automatic) and a little better than the Nissan Versa Note's 31/40 (with a CVT). You won't find a higher EPA city figure in any other non-diesel, non-hybrid car you'd want to drive. The highway figure, on the other hand, is matched or slightly exceeded by a few somewhat larger cars. Small yet tall hatchbacks are aerodynamically challenged. With a bit more poundage and stickier tires, the Fit EX and EX-L don't test quite as well, with scores of 32/38. But I doubt their real-world fuel economy would differ significantly from the LX's. The days when manual transmissions ruled the EPA charts are history. With a six-speed manual, the Honda Fit rates 29/37. While this is better than the 2013 5-speed manual's 27/33, the much zippier Ford Fiesta ST isn't far behind with 26/35. For those who like to row their own, another Fiesta variant, the SE EcoBoost with a three-cylinder turbocharged engine, is the way to go: 31/43. In my real-world suburban driving the trip computers of the Fit, Versa Note, and Fiesta SE EB all regularly reported averages over 40 and as high as the low 50s (with infrequent stops and a feather-light foot). You can't get leather upholstery or a sunroof in the Nissan Versa Note. You can get both in the Honda Fit (unless you want a manual transmission, in which case no cowhides for you). Heated front seats and nav are available in both cars (again, unless you want a manual transmission). Want the latest in safety tech? A rearview camera is standard on the new Fit, while you can get an around view camera on the Versa Note. Want more than this? Then you're going to have to shop a different segment. The Honda's features stack up well against direct competitors, but not so well against those of larger, more expensive cars. I never found the first two generations of the Honda Fit as fun to drive as many other car reviewers did largely because the combination of a high seating position and a goldfish-like view through the expansive windshield was too much like that in a minivan. With the third-generation Fit, Honda has slightly reconfigured the car's packaging. Among the changes, the driver seat is now about a half-inch lower. This doesn't seem like much, but combined with other tweaks the view from the (now height-adjustable) driver seat now seems much more like that of a conventional small car. In the Versa Note, you sit higher whether you want to or not and the steering wheel only adjusts for tilt (the Honda's also telescopes). In the Fiesta, you must contend with taller, deeper instrument panel and a substantially narrower cabin. Combine these attributes, and the view forward from the Ford's driver seat is nearly as offputting as the Fit's used to be. With steeply raked windshields and tall, deep instrument panels now the norm in this class, the Honda Fit's improved driving position ranks among the best of the lot, while outward visibility, aided by large windows, could be the best. Why Not the 2015 Honda Fit? Honda's traditional weakness remains the top reason not to buy a Fit, and by a wide margin. Wind and road noise levels, though lower than in previous generations, remain higher than in the Nissan Versa Note, much less that in the average car. But I could personally live with the wind and road noise. What I especially don't care for is the quantity and quality of engine noise. Compared to that in the Versa Note, the Fit's engine is much louder and buzzier. Some of Honda's other four-cylinder engines area a joy to listen to, and consequently a pleasure to rev. Why not this one? The new 2015 Honda Fit features the touchscreen infotainment interface introduced in the 2014 Civic. It's perhaps my least favorite in any car. There's not even a physical control for volume. Virtual controls for things I'd like to do (such as pause a CD) are either absent or buried. Even the functions I could find were always a click or two away. Only one thing can be displayed at a time, so spent much of my time in the Fit tapping the screen to toggle among various screens. I've never made much use of steering-wheel-mounted audio controls before. With even sub-par interfaces they've never seemed necessary. But the controls on the steering wheel quickly became the only way I adjusted audio volume in the Fit. In defense of the audio sytem, Honda has included a slew of inputs--even HDMI--and made it Apple Car Play compatible. The Fit's new face is much more bold, while avoiding the oddity of some other recent Hondas. Roomy rear seat for such a small car. But the Versa Note's is even roomier. The new Honda Fit's first row has a a few more inches of elbow room than those in the Versa Note and Fiesta. Consequently, it feels like a larger car--unless you also need leg room. Then it's no better than the Nissan. Drivers with long legs will wish the front seat could slide back farther--but this would cramp the magic style of the rear seat. Even drivers of middling height (e.g. me) might find the driver seat uncomfortable. The headrest and non-adjustable lumbar bulge both jut well forward. Depending on your personal size and shape, this might or might not be an issue. Pay close attention before you buy. Honda claims to have increased the Fit's rear legroom by nearly five inches with the redesign--a huge bump to a big car-like 39.3 inches. But while there's far more rear seat space than in a Ford Fiesta, Chevrolet Sonic, Hyundai Accent, or Kia Rio, I found a little more rear knee room (spec sheets be damned) inside the Versa Note. I also discovered more rear headroom inside the Nissan. People my height don't need it, but anyone near or over six-feet tall would. The Honda's rear seat has one more neat trick: it can be reclined a little, but this further reduces headroom. Shoulder room? Three adults best be on exceptionally good terms to share the back seat in any of these cars. With 130 horsepower, the new Honda Fit's "Earth Dreams" 1.5-liter four-cylinder engine has a clear output edge over the 109-horspower Nissan mill. The dash to 60 mph can be achieved in well under nine seconds, versus about ten in the Versa Note. If you want much more grunt, you'll need one of the turbocharged engines offered in the Chevrolet Sonic or Ford Fiesta. I tended to avoid making much use of the Honda's additional potential, though, as all but casual acceleration effected considerable engine noise at an unpleasant frequency. The Nissan engine makes less noise, and what it does make is at least an octave or two lower. The Earth Dreams cacaphony was compounded by the Fit's CVT, which in traditional CVT fashion puts the engine at the optimal rpm and holds it there as the car accelerates. The Fit's engine should be more pleasant to exercise with the six-speed manual, where engine speed and the attendant sounds change in the familiar linear fashion as the car accelerates. But the thrilling sound of the 2.4-liter four employed in the Civic Si and a couple Acuras is as inexplicably absent in the Fit as it would be welcome. The new Honda Fit handles much like it performs: objectively quite competitive, subjectively less thrilling than it could be. The light steering, though quick and precise, feels soft initially and generally fails to engage. The Fit's suspension cuts a tight line when tossed into a curve, the rear beam axle locating its end of the car suprisingly well given its simplicity, but it doesn't beg for such treatment. The Mazda Protege5 I used to own felt far friskier. Not that the Nissan Versa Note is great fun on a twisty road, either. Though endowed with firmer steering and good manners in typical daily driving, the Nissan loses its composure much more readily than the Honda when hustled. Honda might have sacrificed sharper reflexes to improve the Fit's ride quality. Formerly among the reasons not to buy a Fit, ride quality is now acceptable, with bumps heard much more than they are felt. But the Fit still doesn't ride as smoothly as the Nissan, much less the class-leading (in this respect) Ford and Chevrolet. 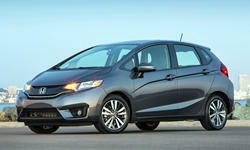 With the redesign, Honda has dialed the sophistication of the Fit's styling up a few notches. Outside, a bolder face and chiseled, Mercedes-like body side surfacing effectively communicate that the Fit is no basic transportation appliance. I especially like how the rear side window parallels the tail light, and how the latter in turn feeds into a prominent character line. Inside, quirkiness has been banished while plasti-chrome trim has been tastefully applied to the vents and elsewhere. I could do without a couple of the newly added details. The faux heat extractors in the rear fascia will fool no one, as the rear brakes, still small drums, won't be radiating many BTUs. The faux stitching molded into the passenger side of the instrument panel is no more convincing. Similar stitching might have contributed to the successful rushed upgrade of the Civic's interior--and this is debatable--but it makes no sense here. Aside from this stitching, the new Fit's interior looks and feels of higher quality than all in the class save the Euro-market-worthy Ford Fiesta's. Except for the insert with the molded-in stitching, nearly all of the surfaces are hard plastic, but these seem sturdy more than cheap. In comparison, the Versa Note's interior comes across as both dated and less substantial. The Nissan Versa sedan leads the class in sales partly, maybe largely, due to a low sticker price. The Versa Note hatchback isn't as aggressively priced, yet still starts significantly lower than the Fit, $14,990 vs. $16,315. But the Honda includes about $2,600 in additional standard features, including cruise control, power windows, power locks, audio controls on the steering wheel, Bluetooth audio streaming, a USB port, and a rearview camera. Compared to a Ford Fiesta, the Honda Fit's price is roughly the same, and thus isn't likely to be a deciding factor (at least not until discounts and incentives, often much higher on the Ford, come into play). Reliable, economical, practical, well-equipped, and affordable, a strong case can be made for the Honda Fit. The smallest Honda's driving position and rear seat room have improved with the latest iteration. But the Fit remains noisy, with the buzzbox under the hood conspiring with the CVT to keep fun-to-drive just off the menu. The Nissan Versa Note cannot carry as much cargo, and can't carve curves with as much verve, but it is quieter and smoother. The Ford Fiesta is the most refined car in the class, and is the most fun in ST form, but it also has the most cramped interior and a spotty reliability record. As is often the case, know your priorities and you'll know which car to get. For practically-minded B-segment buyers, that car will be the Fit. Good power (130) and efficiency (32/38), but buzzy. Thanks to innovative packaging, the rear seat folds to yield a low, flat floor and 53 cubic feet. Honda and Nissan each provided an insured car for a week with a tank of gas. Tamaroff Nissan of Southfield, MI, helpfully provided a second Versa Note so I drive it back-to-back with the Fit. They can be reached at 248-353-1300. 2015 Honda Fit pros and cons, according to Michael Karesh: the best reasons for buying (or not buying) the 2015 Honda Fit. Join TrueDelta to post your own impressions. Why did the dealership provide you with a 2014 Versa Note? The 2015s have been out for about 6 months, and they have a nicer interior (especially with the SR). Still, a small point, and it's good that it didn't figure into your review very much. One of the features that made the original Fitpopular was the wagon like opening of the rear hatch, along with the seat folding that provided use load space that rivalled many vehicles several classes bigger. I was disappointed with the gen 1 Kia Soul as this had an unnecessarily high lip on it's trunk that made it difficult to load large items. The photo of the hatch suggests it lost some of the squareness of the original and has developed a lip. How does the opening compare to the original? I drove a 2015 Versa at the dealer, but also had a 2014 from Nissan for a week last year. I ended up selecting the 2014 that was already in my list of reviewed cars rather than entering a new car. Maybe I should have done the latter instead. I might change it. On the hatch opening, I'm not sure how it compares. It's been a long time since I took a close look at the Gen 1 Fit. Part of my decision to buying a Fit was the crisp and easy handling along with the low floor when back seats are down. I have an old dog that could get into the Fit without a ramp. It has been a practical car to own, easy on gas and a much greater cargo space than anything else I have found. Last month I put a complete Miata engine and transmission through the hatchback opening and was able to close the hatch. I don't think I could do that with any other small compact car.